Lack of symptoms of eosinophilic esophagitis (EoE) does not necessarily mean a lack of disease activity, researchers report in the March issue of Gastroenterology. They found only a moderate association between symptom scores and endoscopic or histologic features of remission. EoE is a chronic, immune- or antigen-mediated esophageal disease characterized by symptoms related to esophageal dysfunction and eosinophil-mediated inflammation. Dysphagia is the most common symptom in adult patients, but swallowing-associated pain and heartburn that does not respond to acid-suppressive medication can also occur. There are no approved EoE-specific therapies, due to the lack of standardized and validated instruments for reliable assessment of disease activity. Also, there has been debate over clinically relevant endpoints for clinical trials. Some studies have reported a dissociation between EoE symptom severity and histologic markers of disease activity. The EoE endoscopic reference score grades the severity of distinct EoE-associated endoscopic features (edema, rings, exudates, furrows, and strictures), whereas the eosinophilic esophagitis activity index (EEsAI) patient-reported outcome (PRO) instrument is used to determine clinical activity in adult patients. Ekaterina Safroneeva et al investigated the relationship between clinical activity (based on symptoms) and biologic activity (based on endoscopic and histologic features) of EoE. They examined the ability of the EEsAI PRO score to identify adults in endoscopic and histologic remission. They performed a prospective study of 269 consecutive adults with EoE who completed the EEsAI PRO instrument and then underwent esophagogastroduodenoscopy with esophageal biopsy collection. 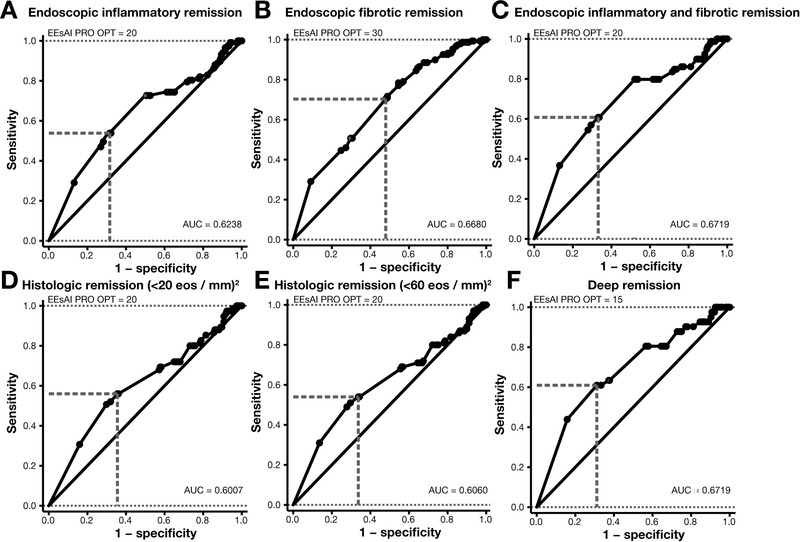 Receiver operator curve analysis to determine EEsAI PRO scores that detect endoscopic inflammatory remission (A), endoscopic fibrotic remission (B), endoscopic inflammatory and fibrotic remission (C), histologic remission defined as peak eosinophil count of <20/mm2 (D), histologic remission defined as peak eosinophil count of <60/mm2 (E), and deep remission. defined as the combination of endoscopic inflammatory and fibrotic remission as well as histologic remission (peak eosinophil count of <20/mm2) (F). Of the study subjects, 41% were determined to be in clinical remission (a symptom score below 20), 30% were considered to be in endoscopic remission (absence of white exudates, moderate or severe rings, strictures, or combination of furrows and edema), and 28% were considered to be in histologic remission (a peak count of <20 eosinophils/mm2 in a high-power field). When the symptom score was used as a continuous variable, patients in endoscopic, histologic, and combined (endoscopic and histologic remission) remission were detected with area under the curve values of 0.67, 0.60, and 0.67, respectively. A EEsAI PRO score of 20 identified patients in endoscopic remission with 65% accuracy and those in histologic remission with 62% accuracy. Safroneeva et al examined the effect of different EoE-specific therapies on the relationship between EEsAI PRO score and various types of remission, and found that remission was not affected by hypoallergenic diets or swallowed topical corticosteroids in the 3 months before the study. They conclude that, at any given time, physicians cannot rely on lack of symptoms to make assumptions about lack of biologic disease activity. Why does the adult EEsAI PRO score detect biologic remission with only modest accuracy? The authors propose that patients’ perception of mild and moderate endoscopic or histologic alterations seems to be relatively poor. Endoscopic and histological features of mild disease cause only mild symptoms, to which patients become accustomed over time. These findings might account for the long delays reported in diagnosis of patients with EoE. Also, Safroneeva et al explain that biopsy analysis might not accurately assess the degree of esophageal remodeling and inflammation that contribute to symptoms. In an editorial that accompanies the article, Alfredo J. Lucendo and Javier Molina-Infante state that the EEsAI PRO score appears to reflect what is happening in the whole organ extent and thickness, which may not be characterized adequately by endoscopy and esophageal biopsies. Lucendo and Molina-Infante say that EoE is unique in that it is a full-thickness esophageal disorder, with inflammatory (not necessarily by eosinophils alone) and fibrostenosing features. Endoscopy, which can assess only the superficial esophageal eosinophilia, is therefore limited in its ability to determine what is happening beyond the mucosal surface. Safroneeva et al and the editorial authors propose the use of technologies such as the endolumenal functional lumen imaging probe to assess esophageal diameter and compliance, and better estimate the extent of esophageal remodeling and overall EoE activity, beyond the endoscopic and histologic alterations.